The best-selling house author of the monastery of Monkwearmouth-Jarrow, the Venerable Bede (c. 672-735) is most well-known for his 'History of the English Church and People.' He wrote a number of biblical commentaries as well, including one on the Catholic Epistles. This copy belonged to the library of Durham Cathedral, where his tomb is still located. 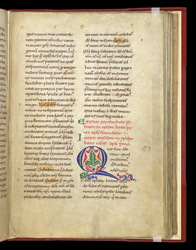 Chapter 2 of the Letters of Peter ends on this page, indicated by the title in red with first letter green ("explicit"), and the Letters of John, Chapter 1 begin ("incipit"). Not having the ability to search electronically, medieval teachers and students needed a lot of help in finding the right place in the text. Besides the enlarged and coloured letters, an industrious librarian has gone through and marked beginnings of paragraphs with a swipe of pale brown and a 'q' in the margin. Also, Chapter 1 is pointed out with a symbol resembling a 'C' plus an 'I'.